Arthur Young was an English writer on agriculture, economics, social statistics, and campaigner for the rights of agricultural workers. Not himself successful as a farmer, he built on connections and activities as a publicist a substantial reputation as an expert on agricultural improvement. After the French Revolution of 1789, his views on its politics carried weight as an informed observer, and he became an important opponent of British reformers. 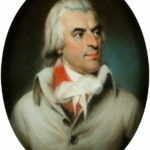 Young is considered a major English writer on agriculture; but it is as a social and political observer that he is best known, and for his Tour in Ireland (1780) and Travels in France (1792).